Each winter, students completing their academic work at the end of January participate in a unique celebration. 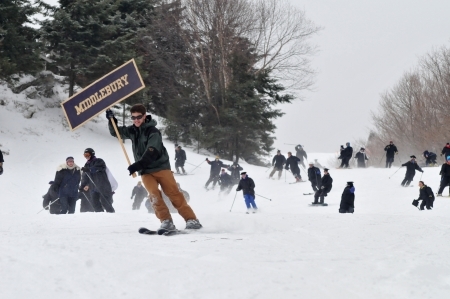 The February Celebration, so-called because most participating students began their Middlebury careers as February first-years, traditionally includes all of the seniors making their way down the trails at the Middlebury College Snow Bowl, in their caps and gowns. Many ski or snowboard, while others walk or snow shoe. It’s a wonderful sight to see! !